Leaves alternate below, opposite on branches, narrowly lance-shaped, to 10 cm long. 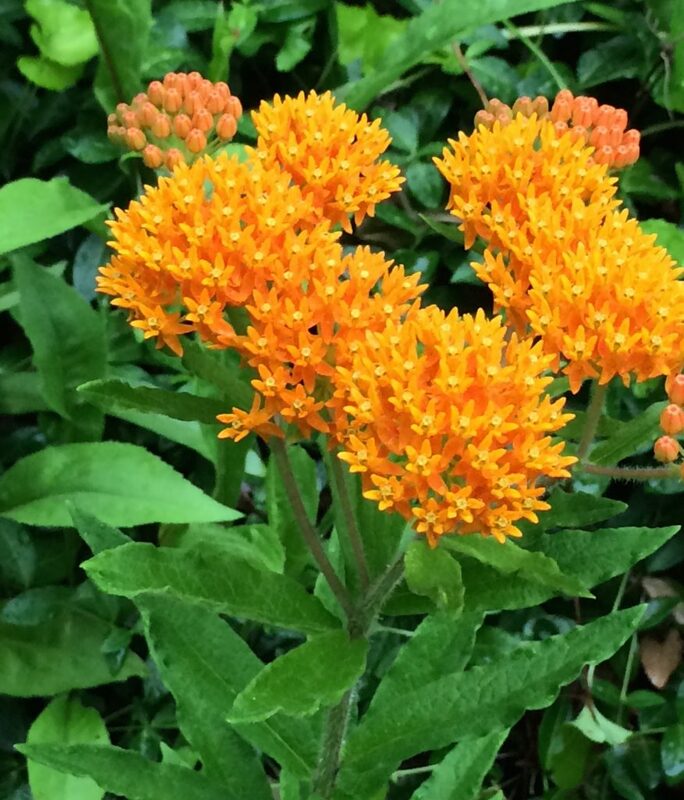 Asclepias tuberosa (butterfly weed) inflorescence. January 2, 2014 copyright © Melton Wiggins. 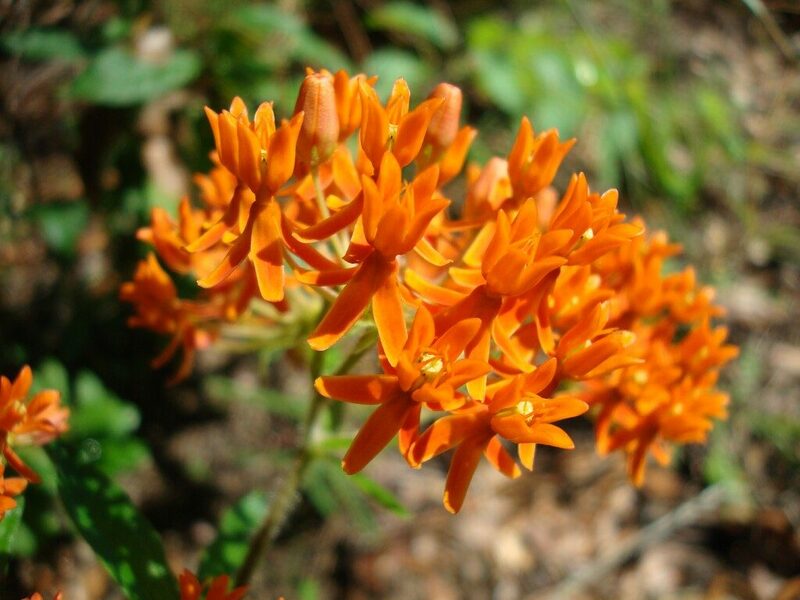 Plants of Southern Alabama and adjoining areas of Mississippi and Florida. meltonwiggins.com (Accessed 11/2017). Flowers orange, ca 1 cm, in umbels, radially symmetrical, 5-parted, petals bent downward, stamens fused around style into a central column that is sheathed by a ring of fused scales (hoods), each scale bears a small horn on its internal surface, the entire central structure called the corona, a signature structure of Asclepiadaceae; mostly self-infertile, insect pollinated by bees and butterflies (Wilbur 1976), June-July. 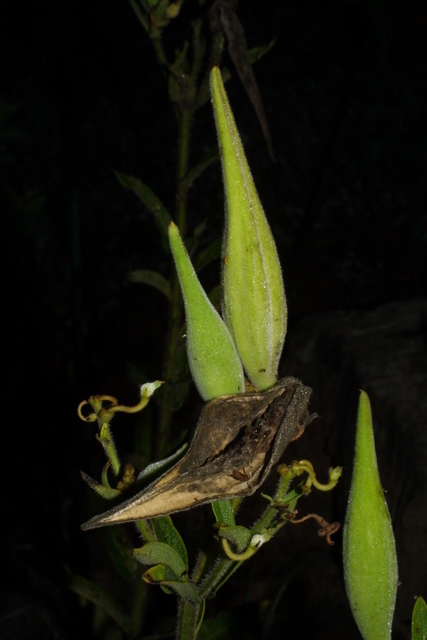 Fruit dry, hollow pod, ca 10 cm, thin, erect, seeds brown, flat, numerous, with silky tufts, wind dispersed, Sept.-Oct..
Habitat: Open, undisturbed, upland areas. Often planted in restorations of meadows and grasslands (Idlewild). Notes: Dormant below ground Oct.-May. Seedlings eaten by rabbits; insect herbivores mostly Hemiptera (true bugs), (Wilbur 1976).